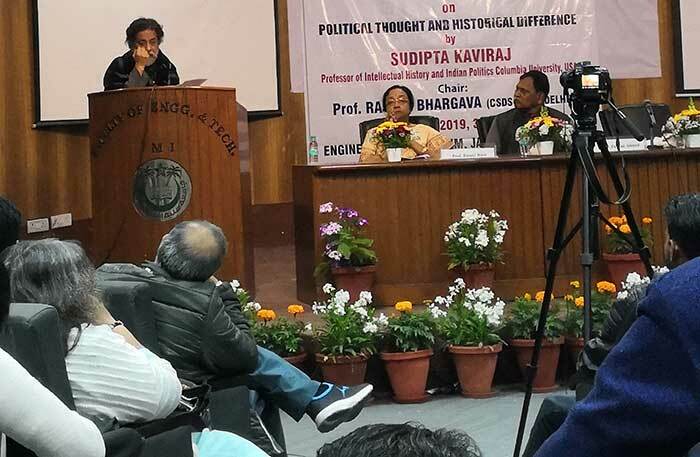 Last evening on behalf of the Political Science department (25th Feb, 2019), Jamia Millia Islamia, has organized a public lecture on “Political Thought and Historical Difference”, by Prof. Sudipta Kaviraj, currently Professor of Intellectual history and Indian politics at the Columbia University, USA. The lecture was chaired by well-known political theorist Prof. Rajeev Bhargava, (Centre for study of developing societies, CSDS, New Delhi). Prof Rumki Basu, former Head of Department has introduced both the guest speaker’s academic work and their intellectual contribution in their respective academic field. It has being noted that Kaviraj has written on various themes such as civil society, nationalism, colonial modernity and historicity of Indian political thought. Similarly, Bhargava has also contributed on the themes like methodological Individualism, Secularism, Civil Society, Indian Political Theory, Democracy, Minority Rights, etc. The present Head of Department, Prof. Furqan Ahmad warmly welcomed respective speakers and introduced the various academic activities currently run by the political science department, JMI. The meeting was also well attended by the students and teachers of JNU, JMI, Delhi University, Ambedkar University and others. Before delivering his lecture, Prof. Kaviraj shared his memory about Jamia when he visited first time and attended a wedding ceremony of a well-known historian of medieval India Prof. Muzafar Alam. While expressing his deep concern on the sudden demise of Prof. Mushirual Hasan, Kaviraj said that we have lost Prof. Hasan who was a noted academic historian and institution builder of our time. At the outset, Kaviraj talked about western political theory and its impact on Indian political thought. While citing the works of noted scholar like Bhikhu Parekh on the Poverty of Political Theory in India, (Prof. Parekh is associated with school of analytical philosophy) Kaviraj noted that in India even we have not produced original political thinkers like Hobbes and Locke. For Parekh, we have not well conceptualized and produced academic political theory in India. Even thinkers like Gandhi, Nehru, Tagore, Aurobindo and other nationalist leaders have reflected on Indian social and political reality, but they are misunderstood to have not produced anything original in nature added Kaviraj. While quoting Prof. Chatterjee works (who was partly influenced by the writings of Gramsci and Foucault), he underlined that our nationalist thoughts were ‘derivative’ in nature which were partly influenced by European thought including colonial modernity. Moreover, problematizing Hegel’s thought on historicity, he expressed that like Hegel and other European positivists historians had produced linear understanding and teleological thought about ‘colonial societies’ and their histories. However, Kaviraj somehow recognized that Hegel’s notion of ‘collective experiences’ in human history is worthwhile to study historical events rather than simply picking out endless facts in isolation as usually done by some section of historians. However, Kaviraj was not fully persuaded by the arguments of Hegel when he says that Greek society was based on principle of beauty. Roman on order, and finally modern society (European) championed the notion of freedom. While showing some sympathetic attitude towards Marx’s works on history of other civilization, Kaviraj pointed that Marx was somehow sensitive towards the notion of “historical difference”. For instance, while theorizing about the western society and its culture Marx underlined that societies had witnessed historical transition from primitive to ancient to feudal to capitalism and so on. However, Marx recognized the distinctiveness of each historical tradition. While studying the colonial situations, Marx talked about the ‘Asiatic mode of production’ which was different from the ‘European mode of production’. In short, although Karl Marx’s writings were influenced by German and European traditions, however, unlike Hegel, Marx analyzed the history of other non-European societies and recognized ‘historical differences’. However, in the case of India like Hegel, Marx was also theorized Indian village community as a changeless and static in nature until the arrival of the colonial power. To note that for Kaviraj, even some section of Indian Marxist scholars have not properly theorized and translated Marx writings correctly as for as his understanding about colonial society like India is concern. Having discussed the theoretical insights provided by both Marx and Hegel on reading history, Kaviraj discussed about the Indian political thought (henceforth, IPT) and underlined influenced of western political theory (WPT). While talking about the IPT, Kaviraj recognized the diversity within Indian traditions and noted that current Hindutva is not sensitive to the plural and diverse traditions of India and see Indian society from the lens of European thought. For instance, the idea of one culture, one nation, one religion, one language could not be actualized in Indian case because of the complexity of thought prevalent in Indian society from ancient to medieval to modern colonial thought. While citing the works of Rajeev Bharagav on ‘Indian Secularism’ and Partha Chatterjee, on the Gandhi, Kaviraj pointed out that both have theorized Indian society from the lens of Indian experiences. For instance, Prof. Rajeev Bhargava works on ‘Indian secularism’ is worthy to be recognized because it is rooted in Indian social political reality. While concluding his talk, he underlined that thinkers of modern India like, Gandhi, Tilak, Nehru, Aurobindo, Tagore, Bankim, Ambedkar and Dr. Iqbal etc. had produced something original but they had also been influenced by European thought to understand the Indian social and political reality. Commenting on Kaviraj well-thought out talk, Prof. Rajeev Bhargava had said that while I agree with him on major points. For Bhargava, his lecture is very persuasive and seriously thought out. And Kaviraj is an academically outstanding scholar of his generation because he contributed in the various fields like Indian politics, philosophy and intellectual history etc. For Bhargava, Indian traditions had been inferiorized and distorted and marginalized by the colonial intellectuals and European thought too. While sharing his views about nationalist anxiety, he said that it is not true that nationalist thinking and imaginations were captive to the dominant European intellectual traditions. After the independence, still we are witnessing ‘Intellectual colonialism’ and our university till 1980s could not be able to produce original thinking. However, situations have been changed after 1980s as we have contributed in the field of ideas which are Indian in nature. The concepts like, secularism, democracy, nationalism, multiculturalism, tolerance, social justice, religious pluralism, minority rights etc. have been produced by Indian academicians who are mostly residing in India, added Indian flavor and prepared ground for generating vibrant tradition of Indian political theory. While sharing his thought further, Bhargava said we have to revisit thousands of manuscripts which are scattered throughout different places in the world but not properly studied and theorized. To be able to understand and channelized intellectual energy in a right direction and to develop original political thought in India, both Kaviraj and Bhargava have finally stressed that we have to master and learn our classical languages like, sanskrit, pali, prakrit and persian etc. While concluding his talk he said that for creating a just and equitable society at the global level, we need to translate all these manuscripts to address the present crisis of intellectual thought. And while doing so, we will not only be benefiting ourselves but the entire global community also added Bhargava. Badre Alam Khan is a Ph.D Candidate at the Department of Political Science, University of Delhi. I am grateful to Prof. Sudipta Kaviraj for giving valuable insights regarding views of Marx about Indian Society and Krishan Kumar (Who is student of JMI, M.A Political Science) for helping and editing the draft.